The holiday season is in full swing here in the Tennessee Valley – and I don’t even have my tree up yet, so that’s what I’ll be up to. But there’s also SO MUCH going on this weekend that it’s hard to know where to start. So strap in, take notes, and down a shot of eggnog… it’s time for the first Huntsville Weekend Roundup in December 2018! Huntsville Christmas Parade – Save the date for Tuesday, Dec. 4 at 6:00 PM! Over 300 trees decorate the park for the holiday season from dusk until midnight each night. 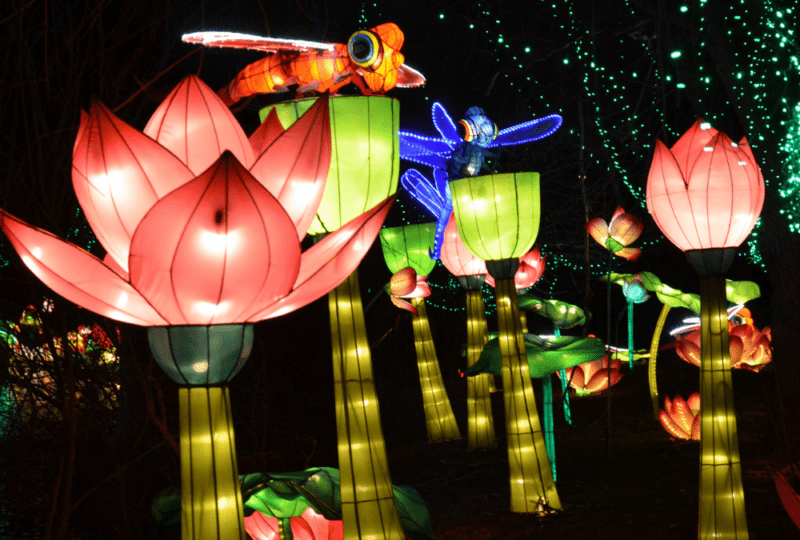 See Big Spring Park turn into a sparkling wonderland through January 6th. 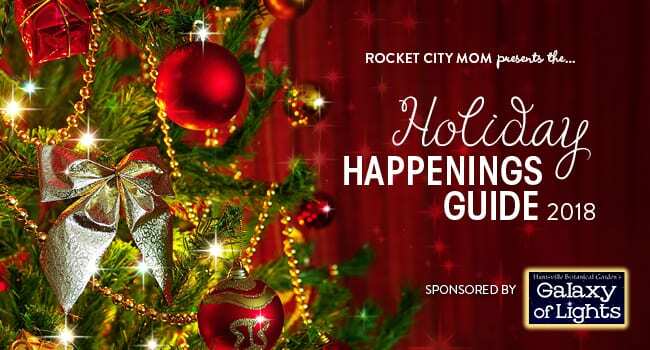 Be sure to look for the Rocket City Mom tree! Drive through the park to see the Christmas Village lights, decorated trees, and giant holiday cards! Enter through Gate 3. See the trees light up and enjoy festive holiday music from the AHS Band. This annual holiday tradition features more than 1 million lights and new displays. This historic village transforms into a winter wonderland complete with Santa’s Toy Shop! There are a couple of great opportunities to treat your kids to a breakfast with Santa this weekend! Kids will make a sled with reindeer in this hands-on workshop that encourages independence and creativity. Read our review before you go. The Pioneer Christmas Village turns into a Christmas Village with photos with Santa, DIY an ornaments, sugar cookies decorating and carriage rides. Come enjoy local musicians, poets, and even a magician, all for a great cause. Food and drinks will be provided. The 2018 Athens North Pole Stroll will return to Big Spring Memorial Park during the month of December with trees decorated with twinkling lights and decked with the creativity of local organizations. This drive-through living nativity scene features live animals, people, and music depicting the First Christmas. How do local wrestlers celebrate their 2 year anniversary? With all your favorite RCCW Stars and lots of surprises in the ring! Come out & see this unique show for yourselves. Read our review before you go. 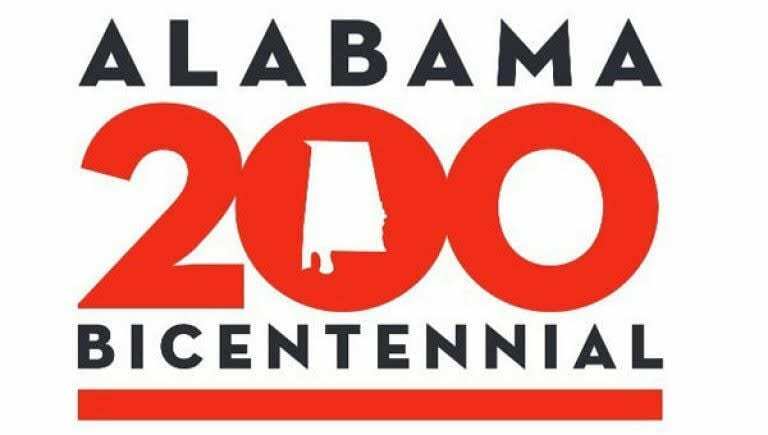 Tubas around the world (and here in Huntsville) will be heard playing the rich, brass tones of holiday music at this 21st annual event. It might sound strange, but it’s REALLY awesome! Advent Market – Shop to support a great cause. Simply Christmas – Creativity comes to the mountain at this popular annual artisan gift bazaar. Sparkman Holiday Bazaar – Shop at this community flea market, craft, and vendor show. Santa sure will! Yule Y’all Market – It’s the merriest time of year at Lowe Mill ARTS & Entertainment! All ages will delight in visiting Santa’s NEW house at the Depot! Meet reindeer and the North Pole elves, play in the snow, enjoy musical entertainment and more at the Village Santa calls home. This Huntsville Holiday tradition performed by Fantasy Playhouse is back with a fresh interpretation of the Dickens’ classic! Read our review before you go. The star-lit mountain will be mirrored by more than 600 candles, music will be heard throughout the mansion and the park, and treats served to the children. It’s one of our favorite Christmas events in Huntsville! Read our review. Kids can enjoy a yummy lunch with Santa, live music, a hot cocoa bar with cookies, and Santa-themed crafts to take home. Don’t forget to bring your camera for a photo op with Santa. Spots are limited and go fast – get yours online now!